Oftentimes when I start a discussion about GMOs with someone online, it turns into a discussion about sources. The person that I'm having the discussion with doesn't trust my sources. I, in turn, don't trust theirs. Last week, I finally sat down to outline why I don't trust some of the most popular anti-GMO sites. The basis of my argument is this: if a site regularly provides incorrect information on other topics, why would you believe that the information they provide on GMOs is correct? If the site does not accept the scientific consensus on vaccines, why would you believe its editors/authors when they say that there's no consensus on GMOs? Of course, if you believe that vaccines are not safe and are full of toxins, then that's a whole other story. If you believe that the CDC is set out to reduce our population, then there's a lot more that we'd have to discuss. So here are some of the sites that I covered. I made the graphics for my Facebook page and you can find them there, too. The OCA frequently writes about the alleged dangers of GMOs. However, they also have many articles about the "dangers" of vaccines, including the thoroughly debunked myth that vaccines are linked to autism. The OCA also touts the benefits of homeopathy, although its efficacy has also been debunked. The OCA's support of such ideas highlights the fact that they are not a reliable source of information on scientific arguments. The March Against Monsanto organization has some noble goals: decreasing the influence that companies have in our political system, fighting to do what's best for our planet, and others. In the past, I've outlined how I share many of these perspectives. However, when it comes to the actual science, March Against Monsanto is truly lacking. Not only does the organization fight against vaccinations, but it shares content about "chemtrails" and the dangerous notion that HIV is a man-made virus. These ideas, which can be classified as nothing but conspiracy theories, highlight that the organization's articles about science are not evidence-based. Dr Mercola is an osteopath whose website is one of the more popular sources of information about alternative medicine. He also sells a lot of supplements. In fact, most of his articles tie in to a product that he sells on his website. However, many of the claims in his articles are untested, and the FDA has issued several warnings. Most recently, he settled with the FTC for up to 5.3 million dollars for claiming that his tanning beds reduced the risk of cancer. PLEASE read this news article, which highlights the dangerous nature of some of his claims. It also points out the vast resources that Dr Mercola has accumulated with his untested, unproven, online empire. then why would you believe such a website? 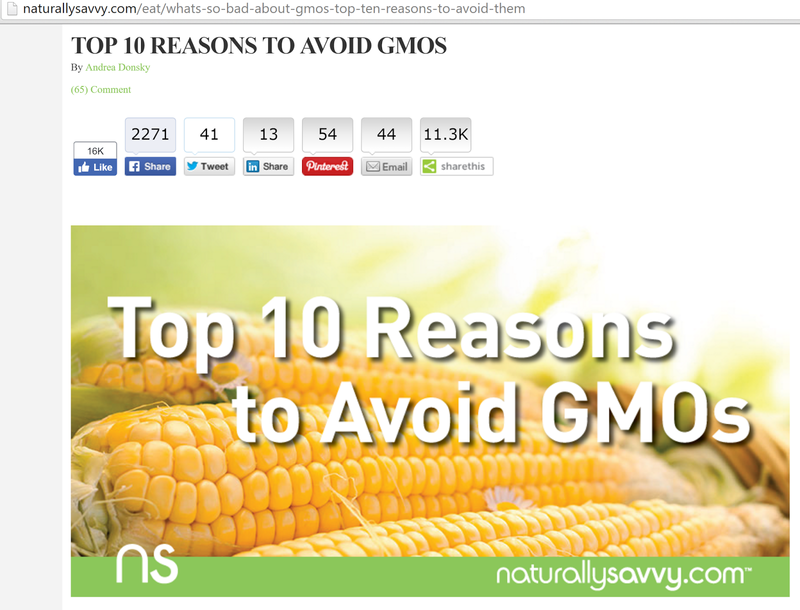 NaturallySavvy's "Top Ten Reasons to Avoid GMOs"
A few days ago, I found myself reading a list entitled "What's So Bad About GMOs? Top Ten Reasons to Avoid Them" (archived here). I first stumbled upon NaturallySavvy.com when they were demonstrating the "toxic" properties in tampons by performing an experiment worthy of a 3rd grade science fair project, in efforts to scare the bejezuz out of you and convince you that their organic femcare products were much better. I'm going to look over this Top Ten List and figure out if there's any truth to it. I've always tried to have a positive tone in what I write, but I'm pretty sure I'm going to fail miserably today. Where's the syringe in the corn?? Or the creepy scientist that always hovers over GMO corn? 1. Are they safe? The article from NaturalSavvy says that although seed developers claim that GMOs have met safety requirements, "long term studies haven't been done on their impact to the human body." Seed developers are not the bodies that claim that GMOs have met safety requirements. The FDA, USDA, and other regulatory bodies are. Just because the writers at NaturallySavvy feel that long term studies are needed doesn't make it so. In the past, I've reviewed why long term human studies are difficult to conduct. Briefly, since GMOs are substantially equivalent to their non-GMO counterparts, there is generally no mechanism by which there could be an impact on the human body. Tests for allergenicity are conducted to ensure that the protein that is introduced is not an allergen. Most people expect GMOs to be tested like drugs, but drugs are designed to cause a change in the human body. Since drugs are altering something in humans, it's important to know the side-effects that they may cause and whether or not they're causing the anticipated effect (i.e. is it better than placebo). In contrast, GMOs are designed to be equivalent to their non-GE counterparts. GE crops which ARE designed to impact human health, such as vitamin-A enriched rice (i.e. Golden Rice), should be tested in humans. 2. Known health risks: The article from Natural Savvy states: "What we do know is that when genetic modification happens, genes are forced to express certain traits (including pesticides). To do this, the scientists "turn on" all the gene's components, which can mean releasing allergens that would normally not be expressed in a non-GMO variety. Experts like Jeffrey Smith suggest this is directly related to the rise in health issues." For the first time in this blog's history, I will ask: "WTF??" What does that string of random, science-y sounding words even mean? To express certain traits, scientists turn on all the gene's components? And somehow turning on "gene components" means that this would release allergens? And then the article has the major cojones to say that Jeffrey Smith, a person with no scientific training, is an "expert"?? In case you aren't familiar with my blog's history, I spent over half a year reading the section on Health Risks from Jeffrey Smith's website and failed to find a single one that was true. Anyway, I can't debunk this because that word salad is actually verbal diarrhea of the Chipotle variety. 3. Heavy use of toxic pesticides and herbicides: The article claims "By design, genetically modified seeds require pesticides and herbicides." That is inaccurate in the sense that some genetically modified crops designed to withstand herbicides. At the same time, no GMO requires herbicides: farmers can technically choose not to apply any. Most importantly, there are GMOs that have nothing to do with pesticides/herbicides, such as the Rainbow papaya, which was designed to be resistant to the ring-spot virus, and saved Hawaii's papaya industry. And what about the Innate potato, which resists bruising and browning and will consequently cut back on food waste? Transgenesis is a method used to generate crops and lumping all the crops generated with the technique into a single category is disingenuous. It is important to note that there are non-GE crops made to resist pesticides as well, such as Clearfield seeds (made through mutagenesis) or SU canola (made by gene editing). 4. Pesticides and digestive health: The article claims that pesticides "negatively impact the gut bacteria of humans" and points to Jeffrey Smith's movie as a evidence. A movie does not evidence make. Show me the data. Unfortunately, documentaries are a narrative and are not peer reviewed. The film makers can choose to portray only one story/perspective in that narrative, and as such, they are often highly biased. In the past I've written on the topic of GMOs and the gut microbiome, and have reviewed several papers on the topic. None of the papers point to negative health impact. But don't let that get in the way of the outstanding evidence in the movie! 5. Cancer: The top ten list from Natural Savvy states: "Both pesticides and GMOs have been connected with an increased risk of certain types of cancer. There are additional health concerns too including reproductive issues, autism and even heart disease." The reference in that statement is to a news article from 2012 that covers the publication of a scientific article which has since been retracted due to its inherent crumminess and republished elsewhere. Many scientists and organizations have written about the notorious Seralini study, which was a 2-year feeding study on rats claiming that the GM feed and low levels of glyphosate cause tumors and other health impacts. Despite claims from activists that the findings from the paper were ignored or that institutions were paid off to refute the paper, Seralini's paper led to several in-depth reviews and studies (see information here from the EFSA and information here about the GRACE project). As for the sentence about alleged reproductive issues, autism, and even heart disease: no, no, and what??? 6. Environmental impact: Naturally Savvy claims: "GMO crops and their companion pesticides and herbicides wreak havoc on the environment including polluting air, water and soil. Glyphosate—marketed by Monsanto as the herbicide Roundup—is in effect, an antibiotic, which can destroy soil quality and thus impair the plant's nutritional value as well." You know, all the farmers that I've spoken to say that they keep buying GM seed year after year because it destroys their soil quality and consequently, the crops. They don't care if the crops have lower yield due to the soil that's been destroyed. They just want to leave their mark in the world by contributing to the environment's demise. Seriously, how is it possible that this article has 15K facebook likes?? 7. Superbugs and superweeds: Naturally Savvy claims: "Despite the claims that pesticides and GMO crops can relieve farmers of crop-destroying insects and plants, the opposite is showing to be true. Farmers in the Midwest are now battling superbugs and superweeds resistant to pesticides. They're damaging crops and farm equipment and costing the farmers more money in having to apply heavier doses of toxic pesticides." Pesticide and herbicide resistance is not unique to GMOs. It's evolution in action. There's even a paper describing how pulling weeds by hand can give rise to superweeds. Thinking that GMOs are to blame for pesticide/herbicide tolerance narrows the scope of the issue and deters efforts of finding genuine solutions to the problem. 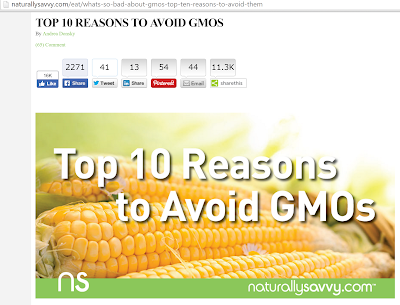 But hey, let's not let facts get in the way of NaturallySavvy's top ten list! 8. Patent issues: "At the core of the GMO industry is the corporate ownership of seed and seed patents. Companies like Monsanto are notorious for suing small farmers for saving seeds or if GMO crop drift pollinates on their land." Farmers moved away from saving seeds quite some time ago, primarily due to hybrid vigor, meaning that the seeds that farmers buy perform much better than the seeds they replant, and it's not just for GMOs. Additionally, farmers have plenty of options on the market. If they do not like the contracts that biotech companies such as Monsanto make them sign, then they can find different seeds. Monsanto has taken farmers to court for having broken this contract. Additionally, such contracts are not unique to GMOs, and farmers have been sued by companies other than Monsanto for replanting non-GMO seeds. As for lawsuits due to "GMO crop drift" pollination, I rebut your pure and utter BS with this lawsuit: OSGATA vs Monsanto, where Organic Food and Seed distributors together with anti-GMO activists tried to invalidate several of Monsanto's patents due to the possibility of a lawsuit due to inadvertent contamination. You read that correctly. Organic Food and Seed Distributors took Monsanto to court. When the judge asked them for evidence that Monsanto might sue them for inadvertent contamination "The appellants concede that Monsanto has never specifically alleged that they infringe its patents, nor threatened suit against them. Nevertheless, the appellants contend that in light of Monsanto’s evident history of aggressive assertion of its transgenic seed patents against other growers and sellers (144 suits and 700 settlements), they must assume that if they infringe those patents, they will also be sued—even if they only infringe inadvertently." Just to make that absolutely clear, Organic Food and Seed Distributors could find no evidence that Monsanto has threatened to sue them due to inadvertent contamination, and based their entire case (which was thrown out) on the possibility that Monsanto might sue them. See what I did there, NaturallySavvy? I provided an original source that is relevant to the argument. 9. Corporate protection: "Earlier this year, the U.S. government passed a bill nicknamed the "Monsanto Protection Act." In essence, it grants biotech companies immunity from the courts, even if a judge determines it's unlawful to plant GMO crops, the companies can do it anyway." It's a scientific fact that if you add "Monsanto" to anything, it becomes 1048 times scarier. How do I know this? Well, truthiness is on my side and my gut tells me so. You know what? I'm not even going to bother with this one, since the act already expired. If you're curious about it, read this article that goes over the legislation. 10. Prolific presence: "Whether or not GMOs are safe has yet to be determined, yet every day, millions of Americans eat them unknowingly due to the lack of labeling requirements. Are you a lab rat? Don't you at least have the right to know what you're eating?" You know what, NaturallySavvy? I think that your readers have the right to know when they're being deceived. Because when the leading scientific organizations in the world state that GMOs are no more risky than traditionally bred crops and when the scientific literature overwhelming supports the relative safety of GMOs, then a scientific consensus is formed. 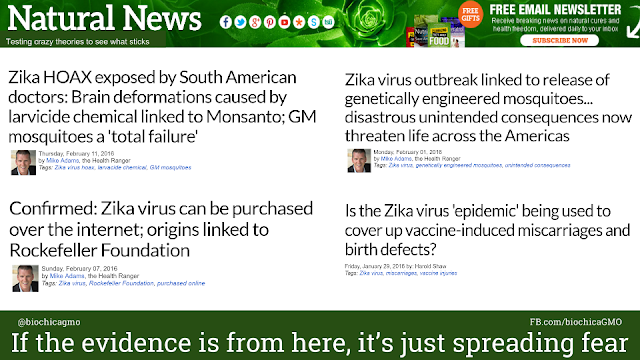 You're trying to scare your readers into buying whatever organic, non-GMO nonsense is for sale on your site. And no. I'm not a lab rat, any more than you're a lab rat for eating organically grown pluots. How long were those tested? Pluots have genes from plums AND APRICOTS!!! That's NOT natural! It took scientists decades to make pluots because these frankenfruits don't happen naturally. Don't you have the right to know what variety of pluots are in your organic Kashi? Oh, the horror!!! WON'T SOMEONE PLEASE THINK OF THE CHILDREN!!!!! And NaturallySavvy? Despite having infinite combinations of scary words at your disposal and the ability to interject science-y words to give your list the aura of truthiness, your outline of arguments #1 and #10 on your list are the same. You should consider having a serious chat with the author of the piece. Wait... The author is also the Founder and "Chief Passionista" of your company? ?